Sixteen Greens from the United States were in. 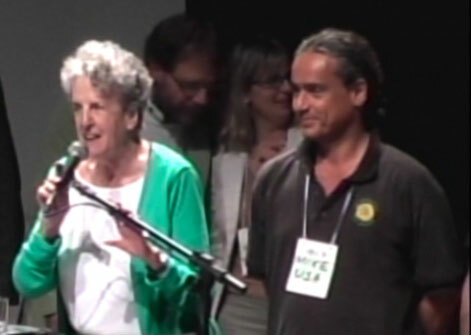 The Green Party of the United States was formally represented at the Congress by three delegates: Mike Feinstein (California), Marnie Glickman (Oregon) and Julia Willebrand (New York); and three alternates: Justine McCabe (Connecticut), John Rensenbrink (Maine) and Bahram Zandi (Maryland). Fein stein and Willebrand also participated for the last two years in the Global Greens Congress Steering Group, which planned the Congress. Bruce Gagnon (Maine) of the Global Network Against Weapons gave a plenary presentation connecting the massive amounts of money and resources devoted to militarism and imperial policies, especially in the U.S., and to the resulting inability of the world to deal effectively with climate change, ecological destruction, and worldwide poverty. He proposed an amendment to the “21 Points”, emphasizing these connections; it was partially accepted. Also giving plenary presentations were Willebrand (Sustainable Cities), Feinstein (Global Greens web site) and San Francisco Green Supervisor Ross Mirkarimi, who was invited by the Heinrich Böll Foundation to highlight work he is doing around issues of climate change in the city/county of San Francisco. Willebrand, McCabe and Rensenbrink hosted a workshop on the topic of relations between the GPUS and other Green Parties in the World, while Glickman co-hosted a workshop on on-line organizing and strategies together with former Green Party of Canada Leader Jim Harris. Lynne Serpe (New York)—who helped organize the U.S. Greens 1996, 2000 and 2004 Presidential Conventions and the 2001 Global Greens Congress—arrived early to coordinate the Congress registration and volunteer effort.